Last night I got my French on at the Alliance Francaise Film Festival, and tonight, I’m doing it all again. Could this be the perfect weekend? I just watched the Julie Delpy movie, ‘2 Days in Paris’. I am an impossible cliche when in comes to Paris. I love Paris. I love the buildings, the food, the people (ok, not so cliche! ), the history, the beauty, the art. Walking through the streets of Paris is like no other experience. Some days I would get up with no other objective than to walk and get lost wandering the streets. On the whole ‘2 Days in Paris’ is quite clever. It has moments of real wit and insight. What I liked was that it did not rely on the city for impact or atmosphere. Most movies set in Paris use it like it embodies a solution to a complex question. The movie presents ‘Paris’ as an interruption rather than an entity that has an ability to influence. 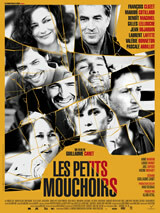 Perhaps it takes a true Parisian (like Julie Delpy) to convey it as it really is. I also liked that at its core the movie was not about cultural differences but about the struggle for honesty within a relationship. About how relationships can go wrong, about what is necessary, about accepting people for who they are. I like that the ending wasn’t ‘happy ever after’. This is us. Meaning him and me. Right now we are just exhausted. We are back from a journey. We saw palazzos, vaporettos and espressos. We were on a journey to Italy. Like the title of a movie with a happy ending. Really we were mostly in Venice. Because it is the city where lovers go. It is also the city over water that will end up under water. Green, ochres, pinks, blues and even greys that shine – that’s Italy. And the pasta – of course. Now it is 2 years that we have been together. Two years of happiness with ups and downs and in-betweens mostly. Night train to Venice – that was my idea. And now on the way back to New York we have decided to stay 2 days in Paris.